Doctor Espresso N3, with its vintage espresso sign, cuts a dashing figure on the busy Fulham High Street. There are two tables on the pavement, and plenty more seating inside. The green double doors are on the left, while two generous windows occupy the remainder of the store-front. Inside, N3’s effectively split into two, with a high-ceilinged front and a cosy, low-ceiling back. Finally, there’s an office on a mezzanine level right at the back which doubles as a showroom for some of Russell’s restored machines. At the front, the layout is like a wider version of the original Doctor Espresso Caffetteria. The counter’s on the right, all glass and lights, and a work of art in itself. Set back from the window, there’s enough space for a couple of tables. As in the original, the espresso machine sits here, facing the window, although it’s a little less prominent. The window itself is taken up with an old dresser which houses one of three tempting cake displays. The seating is on the left, directly ahead of you as you come in. There’s a two-person table just past the double doors, then two four-person tables. There’s a solitary, high table in the middle of the room, in front of the counter, which houses cake and newspapers, but can also be used for seating. At the back, beyond the counter on the right, is a generous kitchen, partially open to the rest of the room, while to the left, there’s more seating in the shape of a couple of two-person tables and a very large, comfortable sofa which is right at the back. The steps to the office are beyond this on the left, more vintage machines (and grinders) being displayed on a shelf overlooking the back part of the shop. N3 is full of glorious old light-fittings, while knick-knacks abound, including a vintage G.E.C. radio on the table to the left of the door and another original lever espresso machine in the window to the right. A gorgeous 1920s till sits on the counter and, while it’s fully working, the ordering is done on an iPad, striking a slightly incongruous note! There’s further incongruity next to the espresso machine, where a very modern twin-hopper grinder dispenses the beans. Wooden floors and furniture give it a very rustic, homely feel and the smell of cooking wafting from the kitchen adds to the atmosphere. Talking of which, the food is an interesting fusion with Italian (panini, calzone), English (scrambled eggs), Aussie (avocado on toast) and American (French Toast) influences all at play. There’s also a full range of pastries and Italian cakes and snacks liberally displayed in the window, on the counter and on one of the tables in front of the counter. Really, anyone would think they were trying to tempt you! I selected the French Toast for brunch. In my experience, when done badly, French Toast can be very disappointing. This, in contrast, was beautifully done, very light, but liberally topped with fruit. Neither too sweet, nor over-cooked, it was perfect. Light is not always a word I associate with French Toast, but this was lightness itself. Heaven! The coffee has a touch of old-school about it. While I like it, third-wave enthusiasts may find it too dark/bitter. I enjoyed the espresso which I had with an excellent cannoli on my first visit and also the flat white that accompanied my brunch on my return. 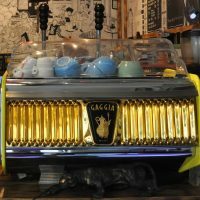 And, of course, I could happily stand at the counter, getting in the way, and watching shots (literally) being pulled on the Gaggia all day long. This entry was posted in Breakfast, Cafes, Cake, Laptop Friendly, Lunch, Sandwiches, South West London and tagged include by Brian Williams. Bookmark the permalink.